I want to thank Joe Wilcox for his help in testing this pattern. Joe's assistance was very valuable to me and his recommendations were put into action. So here you have Three Hats with just one Pattern. This was a lot of fun and great entertainment. This is a series of hats that will be coming out in the next few months in Tapestry Crochet. Because Crochet is Chic and we are going to put it back on the Map. This pattern has links to my videos that will help you with some of the stitches, this was an inspiration I got from Cat Bordhi You Tube Channel, which I have subscribed for a while. I saw her videos for her book and thought what timing as I was making my pattern I decided to emulate her style. Thank You Cat! 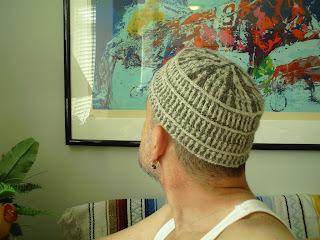 The first Hat Above was very exciting as I had to fix the pattern, grammar and make sense of my creation. This is not a difficult technique yet it is for the Crocheter that wants to challenge himself or herself to something different. Version One was born. Version two is a bit different, but not far from the Version one hat. I think is more of a simple Hat than the other versions. This is my favorite of the three versions. I did not hink that I was going to like this last version of the hat until I was done with it. I used my creativity by alternating the colors and finishing it with one of the optional Alternating Colors Reverse Single Crochet. I like this one the most. I hope you enjoy yourpatterns and thanks for stopping by!